When Daniel ‘jungleman12’ Cates battled against an unknown online poker player using the screen-name ‘Lindqvro’ at the $25/$50 tables on Full Tilt Poker speculation immediately began to swirl regarding the identity of the player –after all, it’s not every day that a brand new player suddenly jumps into a $5,000 buy-in game against one of poker’s best players! The only thing the poker community has to go on as to the identity of ‘Lindqvro’ is the location, and the style of play. 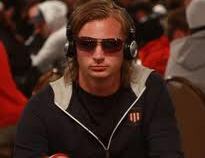 Hailing from Sweden, and implementing a very similar style to a well known high-stakes player, ‘Lindqvro’s’ identity had many thinking it was a new alias of Viktor ‘Isildur1’ Blom, who is now a Team PokerStars Pro, which likely makes his Isildur1 moniker off-limits at rival Full Tilt Poker. Viktor Blom denied the rumors that the account belongs to him on the 2+2 poker forum today, but he also denied the Isildur1 account in the past, and considering this would amount to multi-accounting he has even more reason to deny the ‘Lindqvro’ account belongs to him. However, Blom now lives in London, England, and PokerStars has plenty of $25/$50 PLO tables, so it’s really unlikely that ‘Lindqvro’ is Viktor Blom. That said it could be the screen-name of another Blom; Viktor’s brother Sebastian, who is said to employ a similar style of play to his brother… and Sebastian Blom still lives in Sweden. This entry was posted on Sunday, February 13th, 2011 at 6:33 am and is filed under Poker News. You can follow any responses to this entry through the RSS 2.0 feed. You can leave a response, or trackback from your own site.